The following article uses options that are available starting with the Architect edition and project type. This tutorial guides you in creating a project based on capturing an installation. As an example, we'll repackage the 7-zip File Manager EXE into an MSI. The following steps describe choosing the virtual machine environment. If you want to perform the repackaging operation on your local machine, you can follow Repackaging an installation tutorial. If Advanced Installer is not currently running, launch it from the desktop icon or select it from the "Start" menu. When the application starts, choose “Convert” > “Repackage Installation” project type. The Repackager launches and the project is saved as a .rpp file on disk. 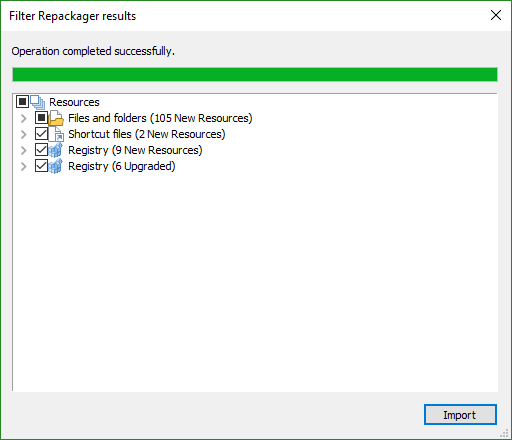 After you select what installer you want to repackage, you can begin configuring the operation. 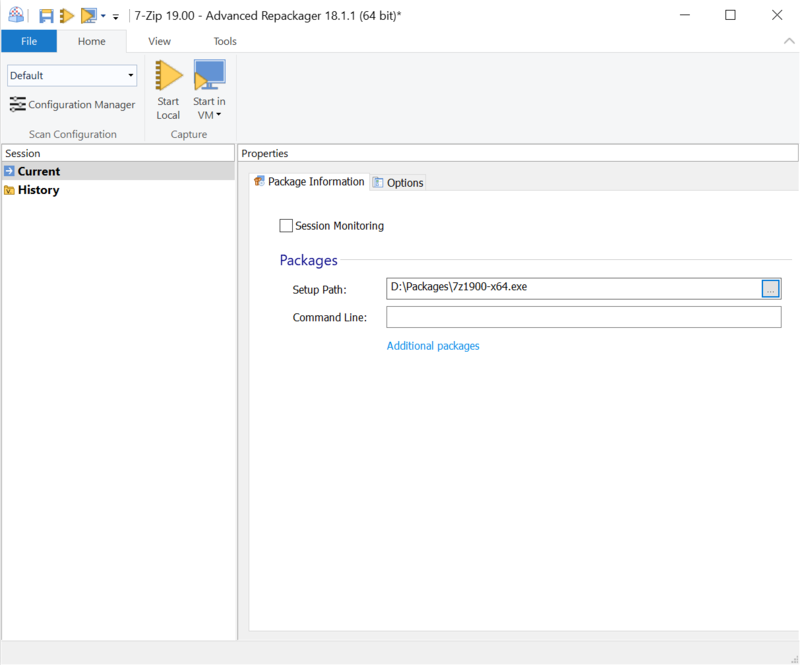 The package information from the installer is displayed here. You can also configure multiple applications to be repackaged at once, use "Additional packages" link to add them. For more information about this tab see this page. The Options tab lets you choose actions and configurations for the repackaging operation. For more information about this tab see this page. There are a few options that are checked by default, but for this tutorial, we also check "Generate .bat file with settings from this session," which creates a .bat file for automation in future repackaging operations. 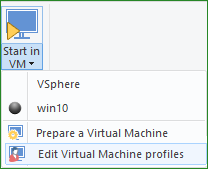 Select/configure a virtual machine profile by pressing on the down arrow on the "Start in VM" button and selecting "Edit Virtual Machine profiles." 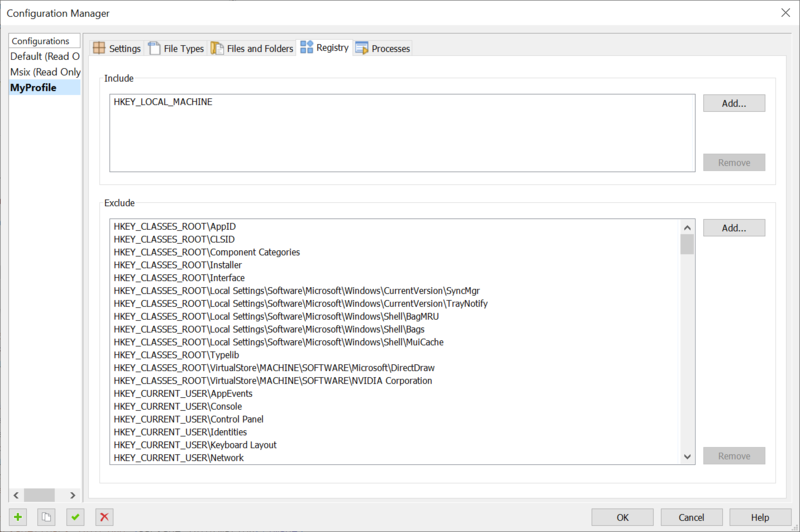 In the Virtual Machine Profiles dialog select an existing profile or create one by right-clicking on localhost from the VMware Servers section and selecting "New profile." 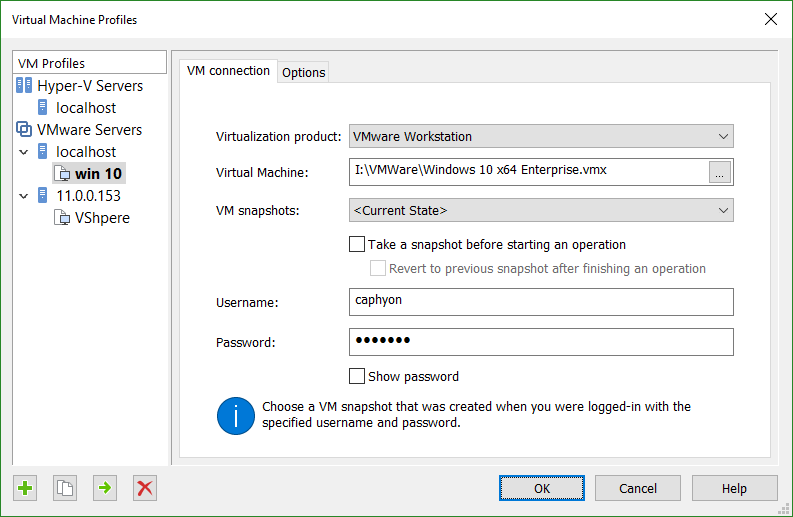 Select your "Virtualization product," "Virtual Machine," and snapshot. Make sure the username selected has admin privileges on the virtual machine. It is essential you first prepare the virtual machine before starting your first capture. Please check the requirements for repackaging in VMware machines to make sure your environment is correctly setup. 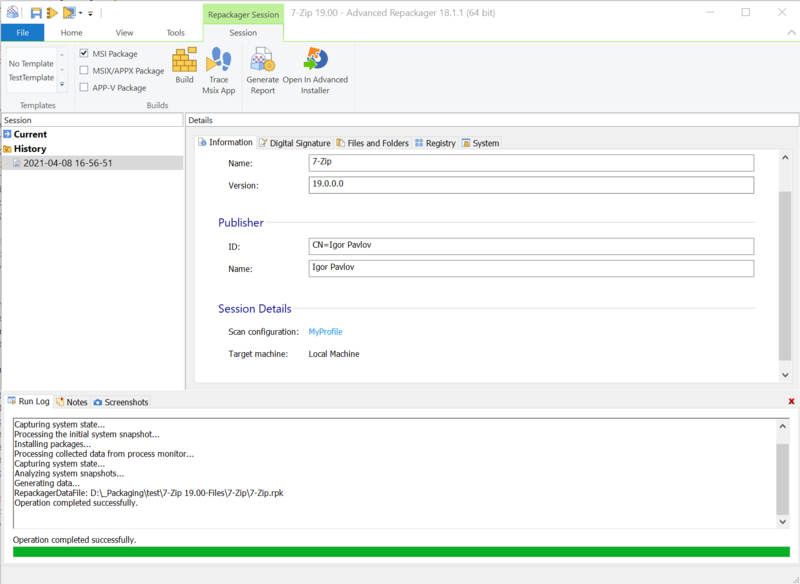 Press the "Configuration Manager" button from the Home tab and begin to customize your capture profile. Create a new profile "MyProfile," which we have tweaked to search for system changes only in the "ProgramFiles" folder and in the "HKEY_LOCAL_MACHINE" registry hive, as the setup package installs per machine. All the other settings remained as in the "Default" profile. We set this newly created profile as active. The profile that is "active" is that one that is used during the system scan unless specified otherwise at the beginning of the installation capture. Before you proceed, make sure that you close all unnecessary running applications to avoid "false positive" capture results from active file and registry system access. 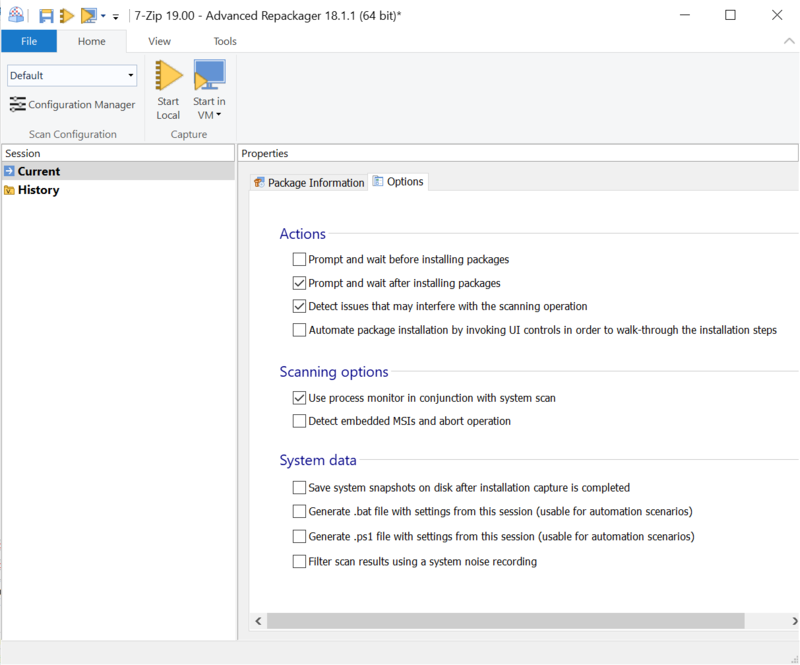 An installation capture is done by comparing system snapshots taken before and after the package installation. Optionally filter the scan results using a system noise recording. The package is launched, and after the installation is complete, the system is scanned again for changes. The result is saved as a session under History and as a .rpk file on the disk. Press "Continue in Advanced Installer" to make the final touches on the newly repackaged installer. Press the [ Import ] button to import the installation capture results, into the new Advanced Installer project. 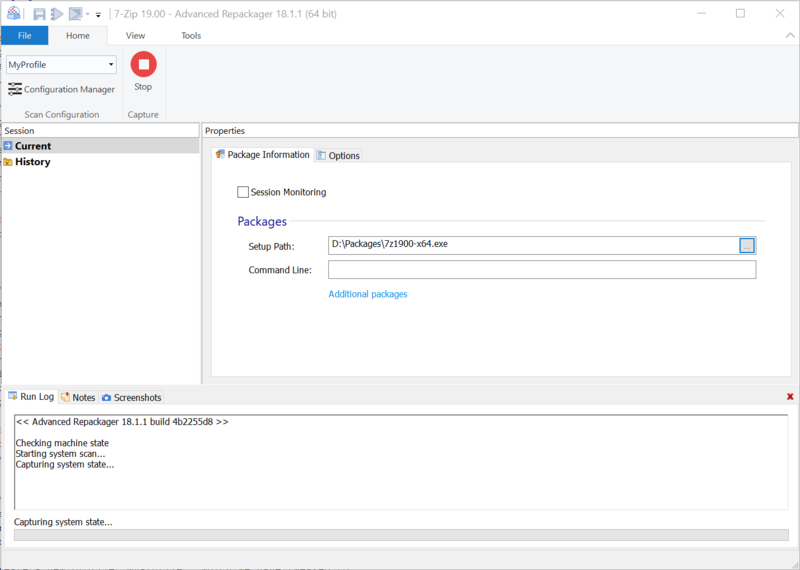 After importing the installation capture results, you should review the Advanced Installer project and adjust it to your new package deployment needs. Build and run the project to test the newly created installer.